There are a ton of Hawaiian lei choices when looking for a lei for a man. Culturally, it’s acceptable for guys here to wear a Hawaiian lei made from flowers, leaves, kukui nuts or even fragrant flowers. As for weddings in Hawaii, the most popular Hawaiian lei choice for a groom is the long, leafy, open-ended lei. They are elegant, outstanding and can be left plain or be twisted with a flower lei to match their partner’s dress or lei. 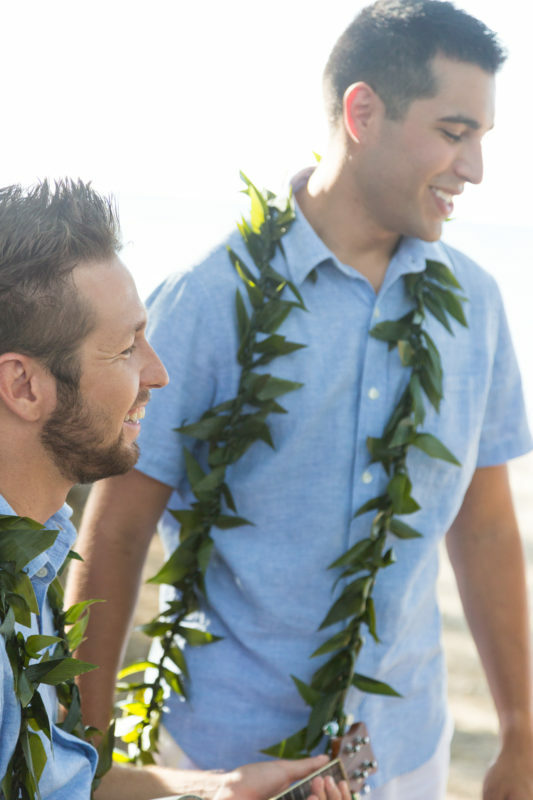 There are several things to consider when choosing the right long lei for the groom. Price, aesthetics and cultural preferences play a big part in deciding which long lei is the one you want to go for. P.S. If you need a lei shipped, check out the bottom of this post! The only maile that is native to Hawaii. These are shipped from the Big Island about 1 to 2 times a week. 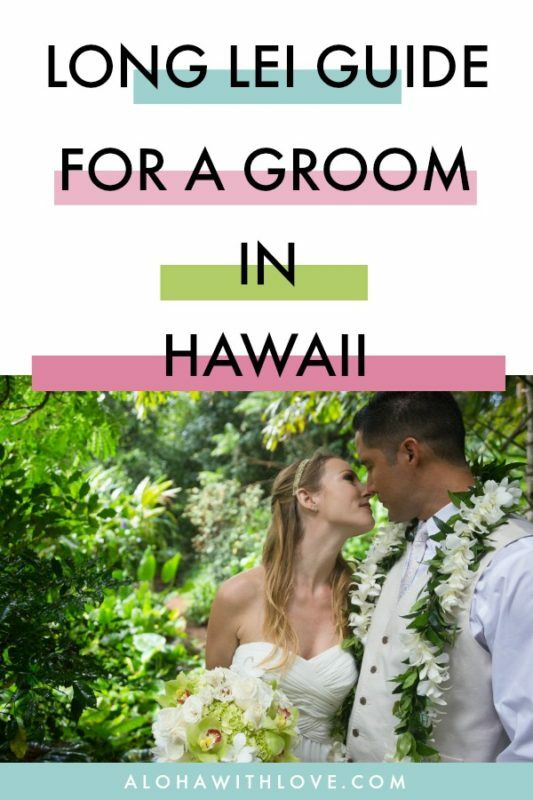 Lovely vanilla fragrance that makes this lei a popular favorite for grooms in Hawaii. Good for those looking for a simple lei as this isn’t extremely thick and overpowering with its leaves. Perfect for those who want a culturally respective Hawaiian ceremony. Will seem skimpy if you’re not used to it since it is naturally skinny and thin. If you’re willing to spend the money, the lei vendor can twist 3-4 Hilo maile together, which is commonly done for very important ceremonies. This lei is on the fragile side and can be easily bruised. Twisting it with another Hilo maile can hide blemishes as the leaves will cover each other. Local Tip: Ask the lei vendor when they received the Hilo maile and if it went through the Dept of Agriculture without any problems. If it was stopped, the agents sometimes keep the maile overnight and may even comb through the whole shipment, which can bruise and break the maile. Almost all lei vendors have the same maile suppliers. Very leafy and lush lei that is strong and generally lasts more than a week in the fridge. Looks great in pictures and if you or your guests are not familiar with a maile lei, this will certainly impress them. These are almost always available at lei vendors (the Hilo maile can sometimes be sold out or stopped at the Dept of Agriculture). May feel heavy and uncomfortable for the groom to wear as the leaves will touch the back of their neck the whole time. Does not have that iconic vanilla scent that the Hilo maile is known and loved for. Local Tip: My personal favorite is the Cooke Island maile since I think it has a faint fragrance to it while still being full and lush. If you’re on a budget, the maile-style is a great choice as it’s not as expensive as a maile lei. Ti leaves symbolize good luck and fortune so it’s still a great (and affordable) choice for a wedding lei. :: Can be kept frozen in the freezer wrapped in newspaper than plastic. Dries exceptionally well and can be kept as a keepsake. May stain light-colored clothing if it is not rinsed and dried out properly. The ti leaves are twisted and braided into a rope, which can make the leaves juicy. The ti leaf smell may turn off those who are not used to the concept of a leafy lei. While I certainly do not mind it, others may not like it so much. But, this is still a very popular lei as it is common practice to gift a ti leaf lei for good luck and fortune. Local Tip: The maile-style can be twisted with either larger flowers like orchids, but also works well with smaller and fragrant flowers like pikake or tuberose. Shares the same pros as the maile-style lei listed above. The most budget-friendly long lei you can get for a groom and ideal for those aiming for a very simplistic ceremony. Can be easily twisted with flowers to “dress it up” since it isn’t leafy and thick. Shares the same cons as the maile-style lei listed above. May seem a little strange on a very tall groom. On the average man, the ti leaf lei will come down to the hip/waist area. So the big questions is, what if you’re not in Hawaii and you want a lei? I have a solution for you!! Check out Hawaii Flower Lei – they are Hawaii’s first online lei shipping company and completely local! They ship fresh leis from Hawaii anywhere within the 50 states. While there are a couple of other lei shipping companies, what sets Hawaii Flower Lei apart from the rest is the quality of their shipments. Each lei is carefully made, inspected and the whole thing is wrapped in cellophane and paper like a gift. Plus, your lei shipment goes out in an insulated box with gel ice to keep everything cool and fresh until it’s destination. The best part? You choose your delivery date!